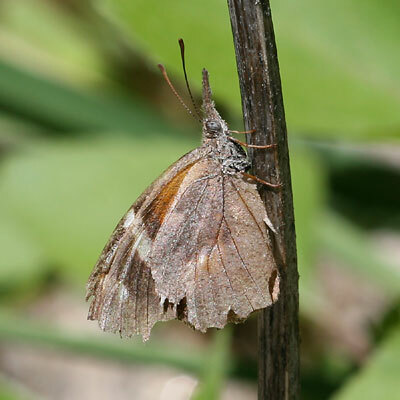 The American Snout (Libytheana carinenta) butterfly will often rest on exposed, dead twigs, and it relies on camouflage to protect it from avian predators. The undersides of the American Snout's hind-wings are a mottled dull brown or gray, the color of a dead leaf. The labial palp (the "snout") is long and extended forward like the petiole (stem) of a dead leaf. The antennae are also held forward to add to the dead leaf effect. The wing uppersides, which are normally kept hidden when perched, are brown and orange with big, white spots. The American Snout in the photograph above was a bit alarmed that I was so close to it, so it raised its wings (showing some hidden orange color) and antennae in preparation for possible flight. The adults feed on flower nectar, while the caterpillars feed on hackberry plants such as a Spiny Hackberry (Celtis ehrenbergiana) or a Netleaf Hackberry (Celtis laevigata var. reticulata).